Consider the Pyramids … Smile, it is all about you! For many of us reaching the top of our Pyramid can be very satisfying, the great sense of achievement knowing that you have used your own talents, sweat and perseverance to get there can bring such a boost to our confidence. This can cause as much of a change in us as the weight training or the cardio! Why? Well in my opinion when you are happy inside it shows on the outside. Simplistic thought perhaps but even for an old cynic like me, there is nothing to beat a smile that says ‘I did it and I did it for me’. We can be physically stunning but if the inside isn’t right, it becomes an act we put on! So what does keep us going and help to fulfil our lives, is it the love of family and friends, a good job, a comfy home, a Gym with a Bar? We very often look to ‘things’ or others to fulfil our lives perhaps it is time to look back at us. Let’s think of one other thing we can do to keep the motivation going, feed that inner creativity alive and pursue our inner talents. Looking at it from the ‘Gym’ perspective, it could be mixing up your workout, join an exercise class as well as doing your weights, go for a swim as well as the morning run anything that stops the feeling of ‘oh no not this again’. The workouts I do with GymGuyMark are very rarely ever the same, they might contain the same elements but normally in a different pattern. For a typical Gemini like me this is perfect, I never get bored and I am constantly amazed at what I can actually achieve. Yes, like Wednesday, there are down times, when the confidence in my abilities hits the floor, but as I discovered yesterday morning, what I perceived as weakness, others saw as strength. No matter how tired I feel or how much my arms ache, I know have the thought that whenever I lift a weight I am achieving something. 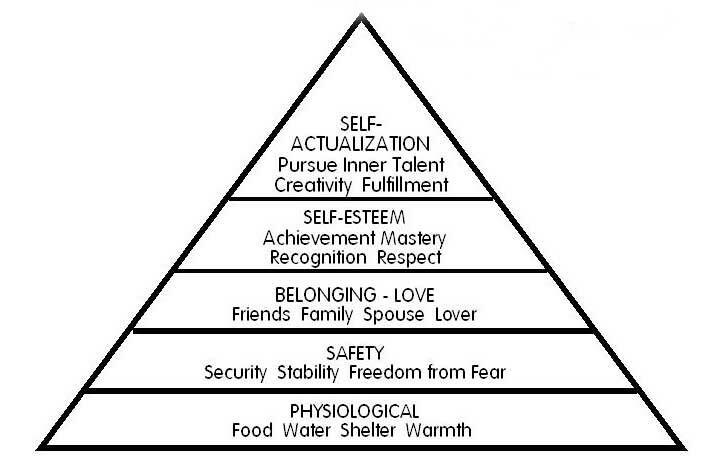 Well my friends, as we nearly reach the peak of our Pyramid, take a wee bit of time to reflect back and think on what you have achieved so far. Here is a question for you, when you get to the top are you going to stop and just admire the view or perhaps look for another Pyramid that you might want to climb? Whatever you decide I hope this series of Blogs has helped make you think, not only about starting something but keeping going. The same principles can be applied from the fittest Gym Bunny to Recovering Gymophobes like me! We all have needs, how we arrange the ‘hierarchy’ is up to us so mix it up, shift things around and from time to time sit back now and again and enjoy the view with a gin in your hand. Thank you for following the Pyramid Blog series this week and for your kind comments. Previous Consider the Pyramids … Go team!